The Disney Den: Weekly Disney Park Surprises in 2013! Disney has recently announced that in 2013 they will be using social media sites such as Twitter and Facebook to spread news about random and impromptu theme weeks in Disneyland and Walt Disney World! This idea is called "Limited Time Magic," and will include sudden dance parties, rare meet-and-greets, new menu and merchandise items, and different decorations with colored lighting. 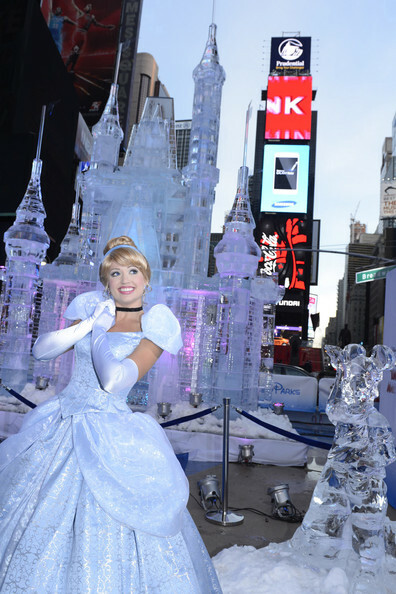 The company gave a little taste of the unexpected magic by erecting a three-story castle made of ice in New York's Time Square on October 17 of this year. Future "Limited Time Magic" ideas include week-long celebrations of Valentines day and the Fourth of July, "Pirate Week," 3-D chalk art, and "Long Lost Friends Week," where rare costumed characters come out of the safe and meet with guests. I'm personally super excited for this announcement, especially since I'll be working there in 2013! It'll be fun to see a different and random themed week without real notice...unless I'm notified beforehand since I'll be a cast member. I hope the "Long Lost Friends" week is while I'm there, it'll be cool to see some old rare characters walking around the park again! What are you excited most for the "Limited Time Magic"? And I have a chance to come see you...but it'll cost $375 bucks. Cross your fingers! It would be January 2-6, would that not work to meet you?